When a child starts school in September after a 6 week summer break, I have to spend at least a couple of lessons going over work they should know. Sometimes I have to go down a level of work because the child has forgotten the basics. Most teachers will tell you that this is called “THE SUMMER BRAIN DRAIN”. Children have too much time on their hands during the summer and they forget some of what they learn during the school year. Avoiding this can save time, and for children who have exams coming up, this can be the difference between a pass and a fail. Academic summer schools can help, as long as the work is tailored to your child’s needs and they have a target to aim for. Past experience has taught us that parents want a more structured approach to their children’s summer learning. They want to see proof of progress. Parents want to take advantage of the free time available during summer and are looking for more than just a child care provider. 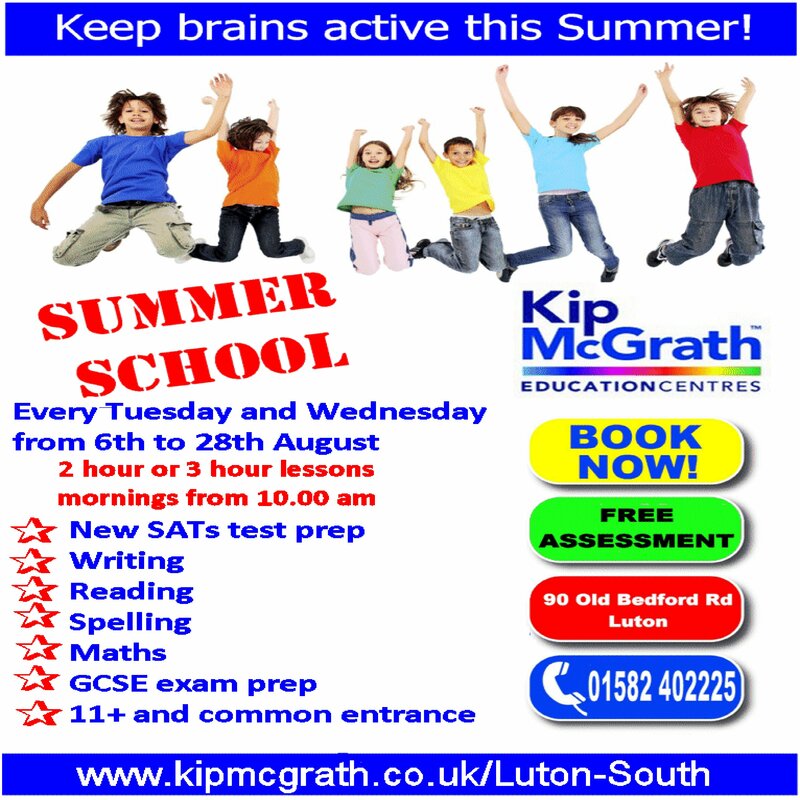 The Kip McGrath Luton Summer School will run every Tuesday and Wednesday in August from the 6th August 2012 to the 28th August 2012. Classes are from 10.00 am with lesson durations of either 1 hour 20 minutes, 2 hours or 3 hours. This year, the format of these classes will be the same format as normal term time Kip lessons, but with a little added extra to cater for your child’s needs. We will be running specialist workshops in the following areas, so when booking your child’s place, please specify which workshop you would like to enrol your child on. To enrol your child or for more info, please call Dr Samina Rashid on 01582 402225 or fill in our online form for a free assessment. If you are a new student we can offer you a free assessment to pinpoint your child’s learning needs and design an individual programme of work to target their areas of need over the summer months. The 11+ exams for Buckinghamshire will be brought forward to early September 2013. Common entrance exams for private schools will be in either December 2013 or January 2014 depending on which school your child will be going to. Example questions in the new 11 + tests can be found here. Many schools enter all year 11 children for early entry GCSE English and Maths exams in the November before they leave school. This means that when children start year 11 in September, they have just less than 2 months in which to prepare for the exam. Children (and parents) panic when they realise this and often it is too late to get help. Please my blog post on this topic to get a more in-depth view. The summer break is an ideal time to work on key skills needed to pass exams. After the initial assessment on your child’s academic ability, we will design a unique programme for your child to follow. This means that we will work on your child’s weaknesses and gradually tailor the programme so that they are working at a level above their expectations. Students need to know what the best revision strategies are. Effective revision methods like using mind maps, flash cards, colour coding and using practice questions are taught hand in hand with subject knowledge so that your child can see which ones work the best for them. All too often children lose valuable marks in exams because they have mis-read the question or not answered it fully. Students on this workshop will learn how to read exam questions properly, how to understand the language of exam questions, how to keep track of time, how to judge the difficulty of a question and how to tackle exam nerves. The speaking and listening unit in English is often overlooked and teachers will focus more on the writing and reading units. In this workshop every student will learn to improve their speaking and listening skills and apply them to their english lessons at school as well as their daily life. Improving speaking and listening reinforces and extend children’s developing reading and writing skills. Students will prepare and present a 10 minute presentation on a subject of their choice. This workshop will encourage students to tap into their natural creativity and imagination. Students learn how to express themselves and tell engaging stories, while picking up good writing habits for a lifetime. Essay writing is an essential skill for senior secondary and tertiary students. Kip McGrath’s popular Essay Writing workshop covers all the essential essay writing skills from analysing the question to editing the final draft. Poor opening argument and essay structure – learn the features of a good thesis, develop skills in analytical reading, presenting a balanced argument, supporting that argument. Exam essay writing – learn how to write a clear, concise and well structured answer within a time limit. Taught by qualified English teachers this Essay Writing workshop will give senior students the skills and confidence they need to approach the rigours of both assignments and exams with confidence. Our science classes always have a practical activity followed by activities to explain the science behind them. Students will learn to use scientific terminology in their lives and apply the science they have learnt to their own experiences. The classes are packed full of information covering the national curriculum, but with plenty of opportunity to have discussions and ask questions. We also cover exam technique and revision methods in this workshop. The new GCSE has “6 mark questions”, which require a good understanding of the topic but also the ability to understand what the examiner is looking for. For students doing triple science at GCSE or the Higher paper, we teach them how to approach these type of questions effectively. The transition from pre-school to more formal learning is a significant one for children. It can affect their interest, motivation at school and their future school success. Kip McGrath’s specialised Get Ready for School programme is a gentle introduction to learning which aids the smooth transition from pre-school to “big” school. Our Get Ready for School programme is an essential for parents who want to ensure the initial school experience is a positive one for their child. The programme includes activities that promote both learning concepts and school readiness skills. Carefully structured course introduces new concepts each lesson and revises previous concepts. Little Learners education programme for nearly new school children. Develop a love of learning in your child from the start of school years. Help your child transition from Kindergarten to Year 1 and improve the chances of school success. Little Learners focuses on building the foundations of literacy and numeracy by engaging children in a variety of structured, yet fun learning activities.